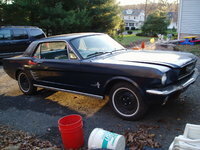 Although originally conceived as a two-seat roadster, the Ford Mustang debuted as a four-seat sport coupe in April 1964. 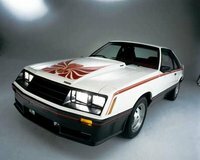 It instantly helped define a new class of automobiles known as "pony cars," which featured long hoods, short rear decks, and sport-oriented features. After making its initial appearance at the New York World's Fair, the Mustang had a memorable cameo in the James Bond movie "Goldfinger," which helped establish its reputation as an iconic vehicle. Within 18 months of its introduction, Ford sold more than 1 million Mustangs, attesting to the vehicle's instant popularity. During its nearly 50-year history, the Mustang has appeared in a number of iterations. After running with the muscle cars in the 1960s, the Mustang took on a more sedate, fuel-efficient Mustang II identity with the second generation in 1974. 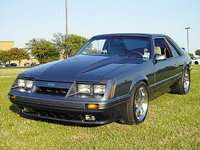 Some of the sporty feel returned for the third and fourth generations through the 1980s and '90s, but it wasn't until the fifth generation debuted in 2005 that the Mustang returned to its pony car roots, with its shark-like front grille, hunky (though noticeably more fuel-efficient) powerplants, and fastback exterior design that echoed the original Mustang of the 1960s. For 2011, the Mustang excels in performance and fuel efficiency, thanks to a new all-aluminum 3.7-liter Duratec V6 engine, which generates 300 hp and ekes out an impressive 31 mpg, making the Mustang the first vehicle to achieve those levels in both categories. The new V6's horsepower nearly matches the output of the previous year's V8 (coming up short by only 10 hp), while greatly improving on the fuel efficiency of previous powerplants. For owners who still have a soft spot in their hearts for a big V8, Ford also offers a new 5.0-liter, 302 V8 for 2011, which delivers 412 hp yet still manages a respectable 17/26 mpg with a six-speed manual shifter (18/25 with a six-speed automatic). 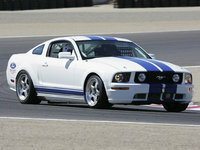 Ford also updated the Mustang's steering and suspension for 2011 for optimal handling and ride. 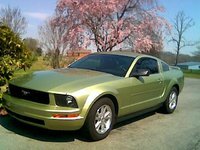 The improvements for 2011 only make a great car even better, according to reviewers, who rank the 2011 Mustang at the top of its automotive segment. 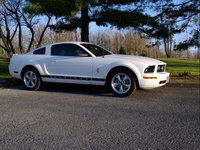 While the Chevy Camaro, Dodge Challenger, and Dodge Charger continue to challenge the Mustang, the original pony car sets the standard for domestic sports cars. Reviewers rave about the new V6, noting its throaty growl and class-leading fuel economy, but many love the performance provided by the big V8 even more. It's all good news for buyers, they note, who can't go wrong with either choice. 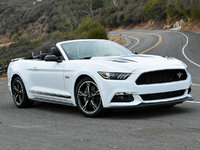 The current-generation Mustang comes in a wide range of trims, including V6-powered Base, Premium, Convertible, and Premium Convertible trims, and V8-powered GT, GT Premium, GT Convertible, Premium Convertible, and GT Premium Convertible trims. In addition, buyers can opt for top-of-the-line Shelby GT500 and Shelby GT500 Convertible trims, both powered by a supercharged 5.4-liter V8 pushing out 540 hp. The Mustang's current fifth generation dates back to 2005, but recent updates in 2010 (which included exterior updates) and 2011 (new powerplants) indicate a next-generation Mustang might be several years in the future. This isn't surprising, since Mustang generations typically stretch for about a decade, give or take a year or so. 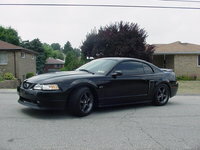 Still, look for new tweaks and trims in the upcoming years, including new Boss 302 and Boss 302 Laguna Seca trims for 2012. They'll both come equipped with a Hi-Po 302 4V Ti-VCT V8 engine generating 440 hp, and will feature unique exterior and interior features, including a front air splitter, a rear interior stabilizer brace, a three-gauge add-on instrument panel, and race-compound tires for the Laguna Seca trim. Ford combined innovation with common sense when creating the Mustang. Although the vision of many at Ford, including Lee Iacocca, was to create a sporty roadster (initially a two-seater before a 2+2 format was settled upon), the automaker kept development and production costs down by borrowing numerous elements from existing vehicles. 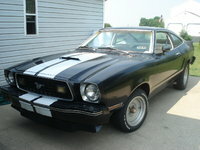 Major elements of the Mustang's chassis, suspension, drivetrain, instrument cluster, and interior, for instance, were borrowed from the Ford Falcon and Ford Fairlane. 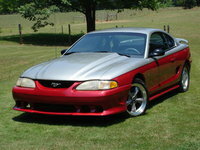 But chrome wrap-around bumpers and a chrome grille emblazoned with the galloping Mustang logo helped make the car unique. The first-generation Mustang went on sale in showrooms in April 1964 and sold more than 22,000 units on its first day of sale, making it the fastest-selling vehicle in automotive history. Power came from a choice of engines. The Mustang was initially powered by a 101-hp, 170-cubic-inch six-cylinder, which came standard and mated to a floor-mounted three-speed manual shifter with an H gate. Owners could also opt for a 164-hp, 260-cubic-inch V8 or a 210-hp, 289-cubic-inch V8. Available transmissions also included a four-speed manual and a three-speed automatic. Although the rear-wheel-drive Mustang was initially available as either a hardtop coupe or two-door convertible, Ford soon added a fastback trim. Early production Mustangs were unofficially classified with the 1964 model year (tagged as 1964 1/2), while later versions rolling off the assembly line were tagged for the 1965 model year. The early trims were outfitted with full carpeting, bucket seats, and a sports steering wheel, and offered a wide range of options, so buyers could customize their vehicles. For instance, 13-inch wheels were standard, but owners could upgrade to optional 14- or 15-inch wheels. Owners could also choose from five different wheel cover options. Within a few months of introduction, Ford upgraded the Mustang's powerplants, replacing the entry-level V6 with a 120-hp, 200-cubic-inch V6, and increasing horsepower for the low-end V8 to 210. The automaker also added a number of new options for the 1965 trims, including an interior package with special seat covers with the Mustang logo, a unique instrument panel, a woodgrain steering wheel, and woodgrain applique on the console and dash. Ford also added a GT package for all trims. Features included a beefed-up suspension, tighter steering, a sport-oriented instrument panel, and dual exhaust pipes. In addition, the first of the Shelby GT350 and GT500 Mustangs, named for race-car driver and automotive designer Carroll Shelby, debuted in 1965. Ford made a few cosmetic changes to the Mustang in 1966 and gave the pony car a more extensive refresh in 1967, which included a slightly longer body (by 2.7 inches), a new 320-hp, 390-cubic-inch big-block V8, and a new transmission, called the FMX. 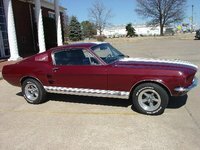 Outside, the '67 Mustang received a new grille, redesigned side scoops, larger taillights, and a restyled fastback. Inside, new features included a tilt-away steering wheel and an overhead console. 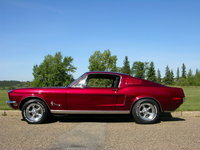 Also in 1967, Ford introduced a new 355-hp, 428-cubic-inch V8 for the Shelby GT500 Mustang. In 1969, the Mustang again grew longer (by 3.8 inches) and hunkier, in an effort to compete with muscle cars like the Pontiac Firebird and the Chevy Camaro. 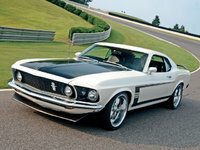 Ford also introduced the Mach 1 and Boss 302 body styles, which replaced the GT. The Mustang sat on a larger chassis designed to accommodate big V8 engines, like the new 429. 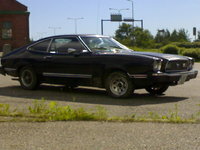 Features of the Mach 1 included a fastback Sports Roof and a matte-black hood. 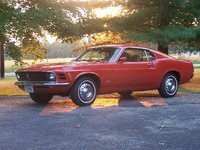 By the early 1970s, muscle cars were becoming outdated, and Japanese imports were beginning to flow into the country, prompting Ford (which was being run by Iacocca at this point) to remake the Mustang as a smaller, more fuel-efficient vehicle. 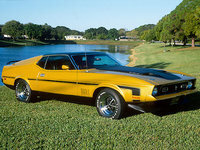 When the second-generation Mustang debuted in 1974, it was so different from the original version that the automaker dubbed it the Mustang II. Based on the rear-wheel-drive Ford Pinto platform, the Mustang II was about the size of the original Mustang, though heavier, which affected its performance. 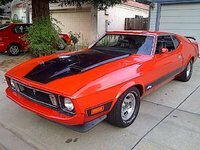 Available as a two-door coupe or a three-door hatchback, the Mustang II did away with the big V8s of the previous generation, and instead was powered by a 102-hp, 2.3-liter four-cylinder engine, which came standard, or a 119-hp, 2.8-liter V6. In designing the car, Ford tried to give it an upscale, luxury feel, but the car failed to catch on with buyers, although the oil crisis of 1973 and '74 helped drive its sales. In an effort to pump up the power, Ford introduced a new 122-hp, 5.0-liter (302-cubic-inch) V8 in 1975, which increased to 139 hp in 1978. 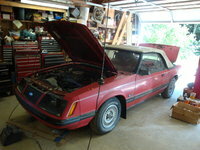 The second generation turned out to be the Mustang's shortest, a testament to the fact that Ford wanted to sweep it under the carpet as quickly as possible. 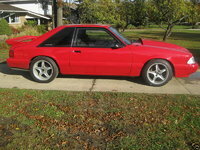 The third-generation Mustang debuted in 1979, and would remain in showrooms until 1993, in part because a planned front-wheel-drive version, set to debut in 1987, was instead spun off as the Ford Probe, while the Mustang remained a rear-wheel-drive vehicle. Doing away with the European-inspired design of the second generation, the third-generation Mustang moved back toward the sporty side, with a tapered hood, squarish headlights, and a fastback roofline. 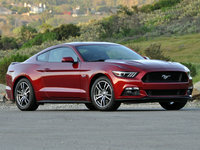 The new Mustang sat on a larger Fox platform borrowed from the Ford Fairmont, and although it accommodated four passengers, the rear seat was tight for adults. Two-door coupe and hatchback trims were initially available, although Ford added a convertible in 1983. Power was provided by a variety of engines, ranging from a 2.3-liter four-cylinder to a 5.0-liter V8. In 1980, Ford replaced the big 302 V8 with a more economical 255-cubic-inch V8, which some owners found underwhelming. 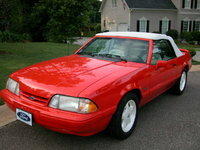 Through the 1980s and into the 1990s, Ford made numerous updates to the Mustang. 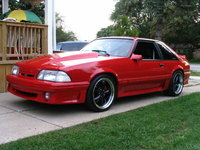 A new Cobra trim appeared in 1979, a five-speed transmission was offered in 1983, fuel-injected engines appeared in 1986, and new SVT Cobra and SVT Cobra R trims debuted in 1993. Given the long self life of the third generation, the fourth-generation Mustang was a breath of fresh air when it appeared in 1994, displaying an even sportier, more muscular exterior design. Still sitting on a rear-wheel-drive platform, though this one was dubbed the Fox-4, the Mustang began to reclaim some of its original glory. 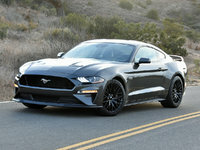 The Mustang also returned to its original body styles, the coupe and convertible, as the hatchback disappeared from the lineup after a run of more than 20 years. Power came from a 145-hp, 3.8-liter V6 or a small-block 302 V8, which was dropped from availability a couple of years later. It was replaced by a more efficient 4.6-liter (281-cubic-inch) V8 in 1996. 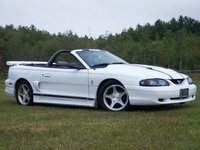 Also in '96, Ford bumped up horsepower for the base V6 to 150 hp. In 1999, Ford introduced a couple of new powerplants, including a 190-hp, 3.8-liter V6 and a 260-hp, 4.6-liter V8. A Bullitt special-edition Mustang appeared in 2001 (to commemorate its appearance in the 1968 Steve McQueen movie), a Mach 1 trim was available in 2003 and '04, and a new Cobra trim, with a 390-hp V8, was offered in 2003 and '04. When the fifth generation debuted in 2005, the Mustang had come full circle, returning to its styling roots. The car's exterior design proportions, as well as its iconic front end and grille, borrow extensively from the original Mustang. However, under the skin it was a completely different car. Sitting on a new D2C platform, it was initially powered by a 210-hp, 4.0-liter V6, which provided base power, or a 300-hp, 4.6-liter V8, which powered the Mustang GT trims. The fifth-generation Mustang stretches 6 inches longer than the previous generation, resulting in more interior space. However, the new Mustang displays the long hood, short deck, and muscular stance reminiscent of the first generation, while side scoops and the shark-like nose bring familiar styling cues into the present. Inside, it even retains the original 2+2 seating configuration, with room for four passengers in front and rear bucket seats. Ford also offers a number of ways for owners to customize their vehicles, including three design schemes and a color-configurable instrument panel, which recall the customization options of the original vehicle. When it comes to used versions of the Mustang, the choices are fairly black and white. The original Mustang, as well as the recent fifth generation, which draws numerous styling cues from the first generation, remain the favorites with most buyers, including a large following of enthusiasts who live and breathe all things Mustang. First-generation Mustangs, as well as unique trims from the 1960s including the Shelby Mustangs, remain highly coveted by collectors in particular. Current-generation Mustangs make good buys. Some owners have found the base V6 powerplant a little underwhelming, so buyers who value performance should opt for V8-powered trims. However, the recent V6 powerplants provide very good fuel economy for buyers who want a common-sense muscle car. 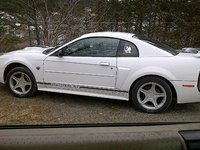 Certain trims built after 2007 came equipped with optional navigation and satellite radio, and all Mustangs built after 2008 have seats created with plastics and foam made from soybeans. 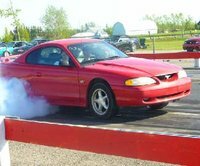 Fourth-generation Mustangs, built from '94 to '04, also make good options for prospective buyers. 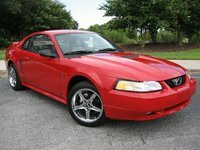 These versions retain some of the original Mustang muscle and mystique, and deliver good performance, especially trims equipped with V8 powerplants. However, some owners found fault with the handling and interiors of the fourth generation. A number of reviewers point to the Cobras of '99 and '00, as well as GTs of any year in the fourth generation, as good choices, although they can be difficult to find. 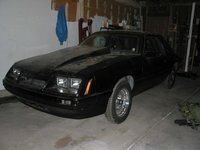 Earlier generations of the Mustang will appeal mostly to the budget-minded, although even the Mustang II has built a network of aficionados who value the car for its uniqueness and collectible appeal. The 2020 Ford Mustang has been announced, but it is not yet available for purchase. Start a new Ford Mustang question. I met a buyer through your site, he wants to pay cash. How do I send you the $99? 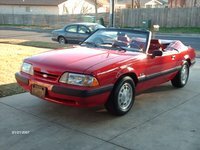 i have a 1996 ford mustang gt convertible,4.6 litre,5 speed manual sohc how much horsepower does my car have? 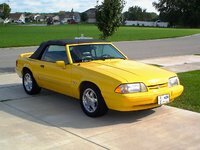 something is draining the battery of my 2003 mustang convertible v6. we pulled the fuses looking for the drain. when we pulled the fuse for the GEM the drain stopped. How can this be fixed?